I like webcomics, webfiction, cycling, writing stories and, when I can afford it, travel. My ambition is to write a novel and publish it. I studied Physics with German at university. It's the 2nd half the the 21st Century. Climate Change has changed the way most communities have had to live. One adaptation to Climate Change is Breath City. If local weather conditions are going to be in flux, local crops may need to change. What if you could move the farmers, researchers, their support teams and everyones' families to where the climatic conditions are right for the crops you want to grow? 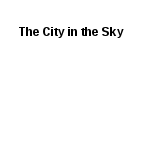 Breath City is a collection of large airships. The envelopes are covered with solar cells to provide power to the engines and to charge the batteries. Each gondola has at least two levels and each level has possibility of extending one (or more) bridge(s), on both the port and starboard sides, to connect with other airships. What's it like to live and work in the sky? I aim to update Sundays (UK time). In order to give realistic projections of climate I am using: sdwebx.worldbank.org/climateportal/index.cfm?page=country_future_climate&ThisRegion=North%20America&ThisCcode=CAN, CMIP3, A2 model, 2060-2079, initially at Guelph but will move it when I give Breath City a firm location. Written by HiFranc, story edited by Joelle.